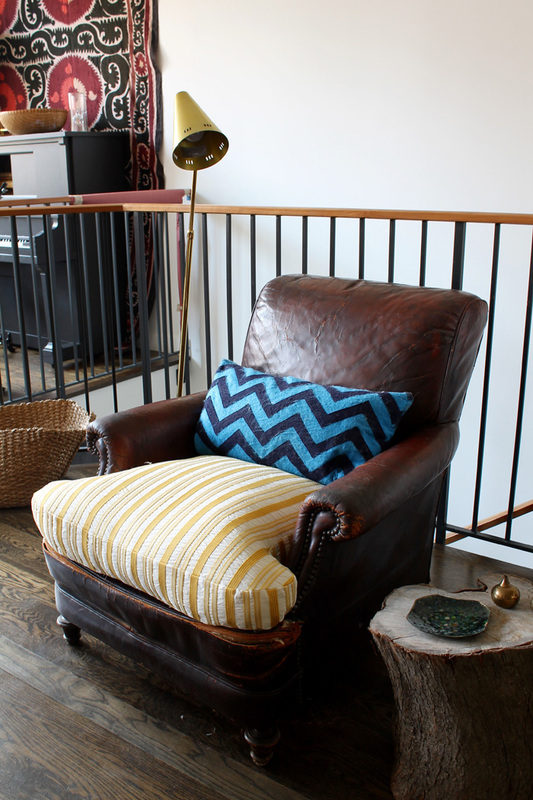 This week I made a new cushion cover for my very beaten up leather chair. 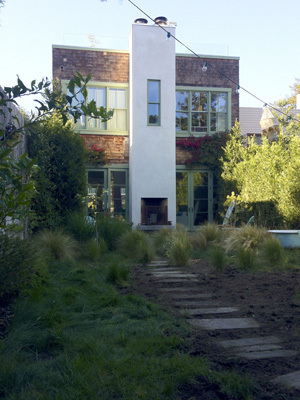 This is the second iteration of this (the first version is here). I wanted to replace the previous cover with something a bit more cheery. We shall see if this lighter fabric is a fool's folly with the heavy rotation this chair gets from the cat and dog. This cover is washable but some shenanigans are beyond remedy IRL. I traced my previous cover onto my new fabric. Remember to prewash the fabric to account for any shrinkage that may happen down the road. 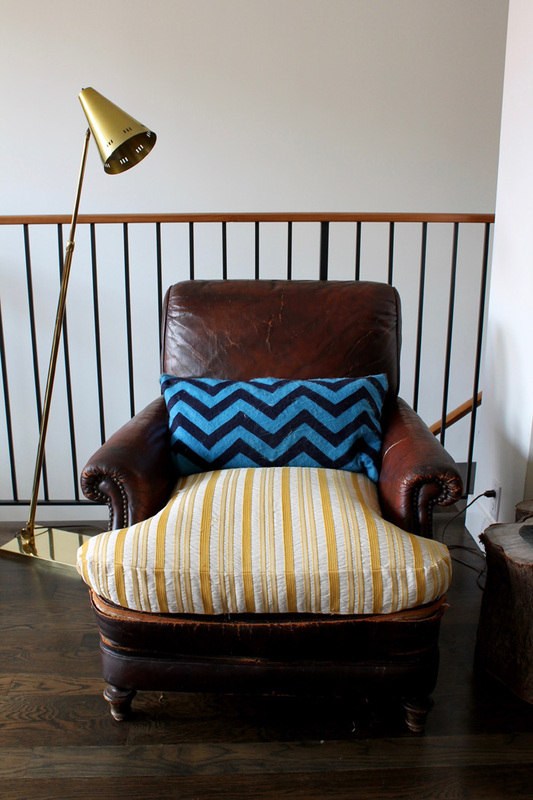 Because I was working in a repeat stripe, I tried to align the center so that the pillow had symmetry. 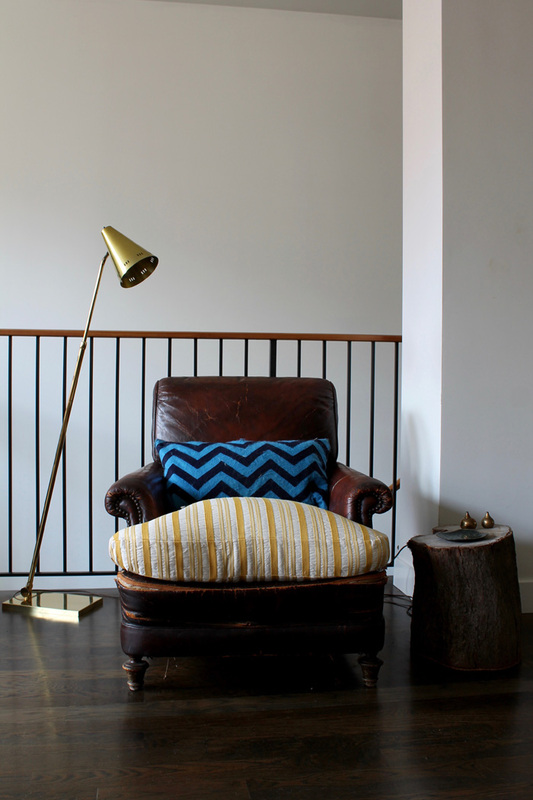 In a stripe that would generally mean that the stripe itself would not go down the center of the pillow but that the two center stripes would split the middle, if you follow. Also I decided not to use piping for this project, so I was careful to align the stripes of the box cushion panel with the top and bottom pieces. 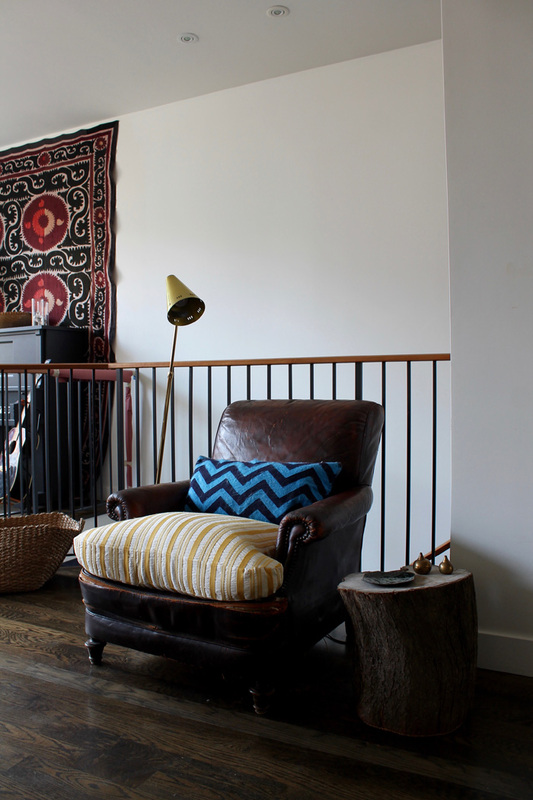 A box cushion slipcover may seem intimidating but really it shouldn't be considering that it is simply a two sided pillow connected by a middle panel. The trick to keeping this simple is by using two panels for the midsection -one for the front and one for the rear, which has the zipper. 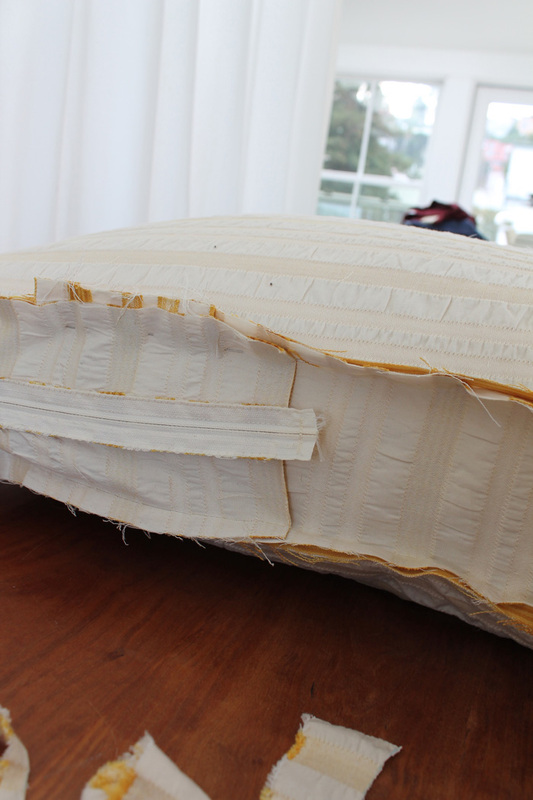 After cutting out the top, bottom and front panel sections, begin the zipper section. This panel must be a little wider than the front section to account for the zipper. In this case my front panel was 5" wide and the rear one I cut to 6". I then immediately cut that 6" section down the middle into two 3" sections. 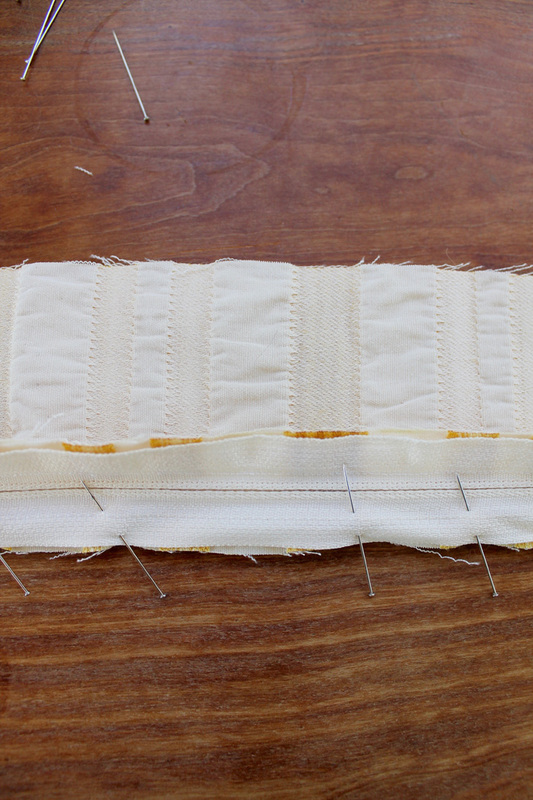 Align the zipper and pin (the two right sides facing each other). 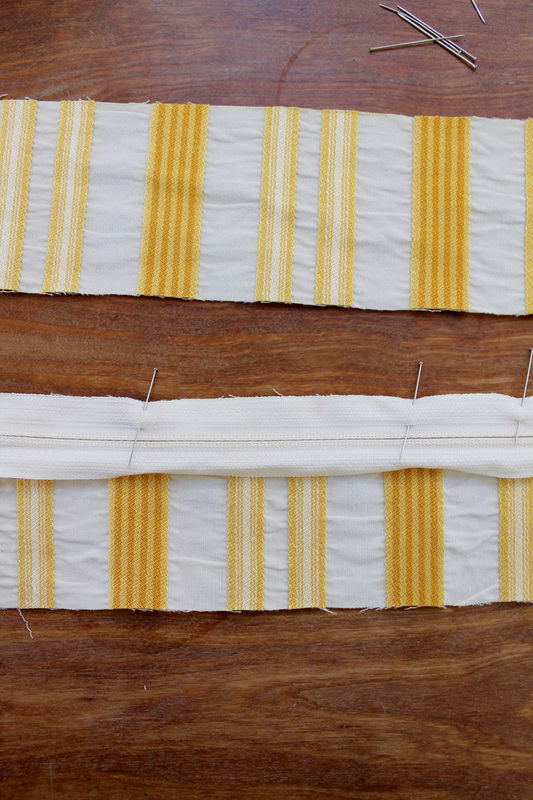 Sew the first zipper section, align the stripes and pin again with right sides facing each other. This would be a good time to mention that I use a length of continuous zipper for this project. Additionally, I also cut my zipper to be about 2" longer than my panel so that I can move the zipper pulley completely out of the way when I sew the zipper to the fabric. Pinned and ready to sew. 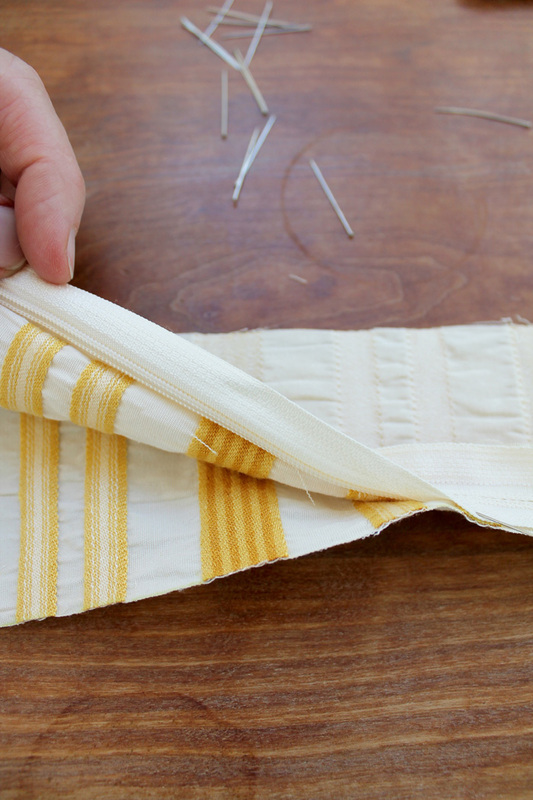 Don't forget to finish the edges with a zigzag stitch so they don't fray. 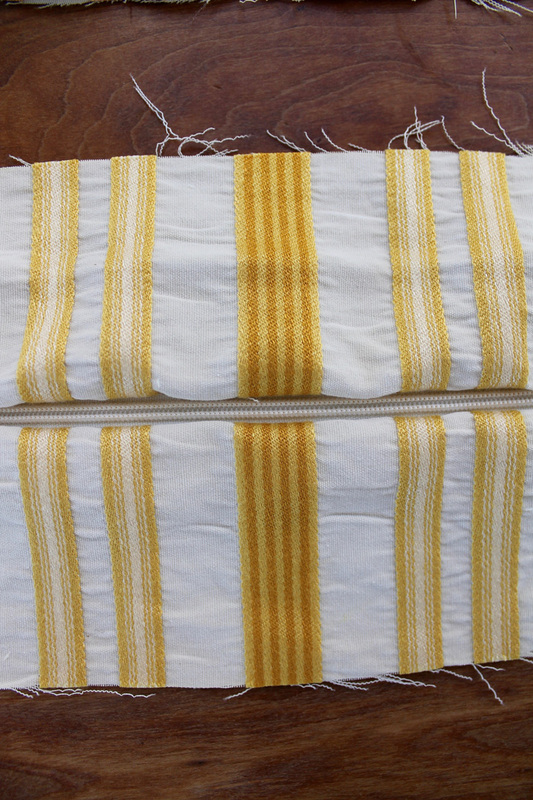 This is what the front will look like after sewing in the zipper. 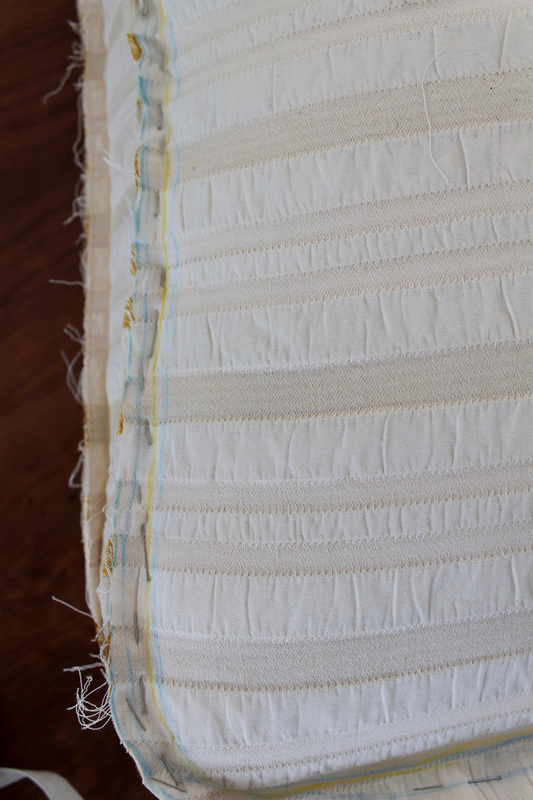 Then it is time to press into place the overlap which hides the zipper. Ordinarily I would pin and sew this overlap along each side of the zipper to keep it hidden. I found that this fabric was very prone to puckering when doing this so I left it as is. 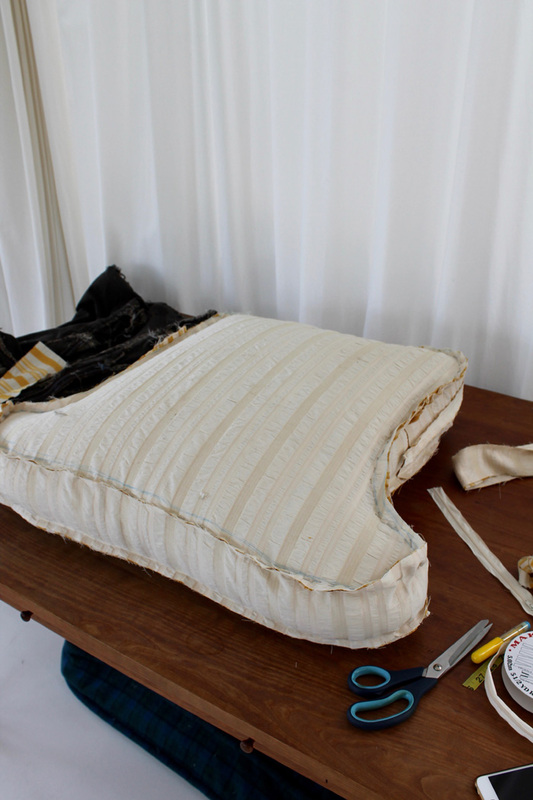 Begin assembling pillow by sewing the front panel to the top -just follow the edge. Then pin the rear panel to the top and sew. After this, I place the cover inside out on the insert and align and pin the bottom. This allows me to make adjustments in the fit. I was a little big around the T sections here, so I increased the seam allowance. 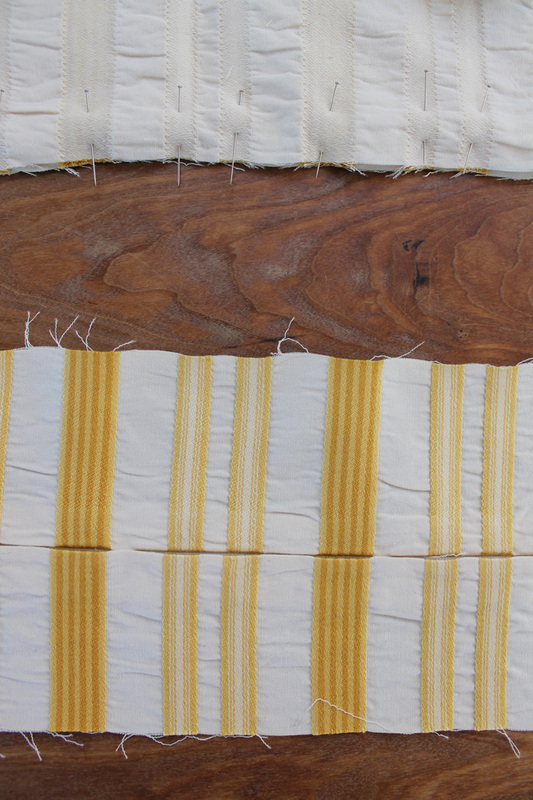 I traced a new sew line in yellow chalk once everything was pinned in place. 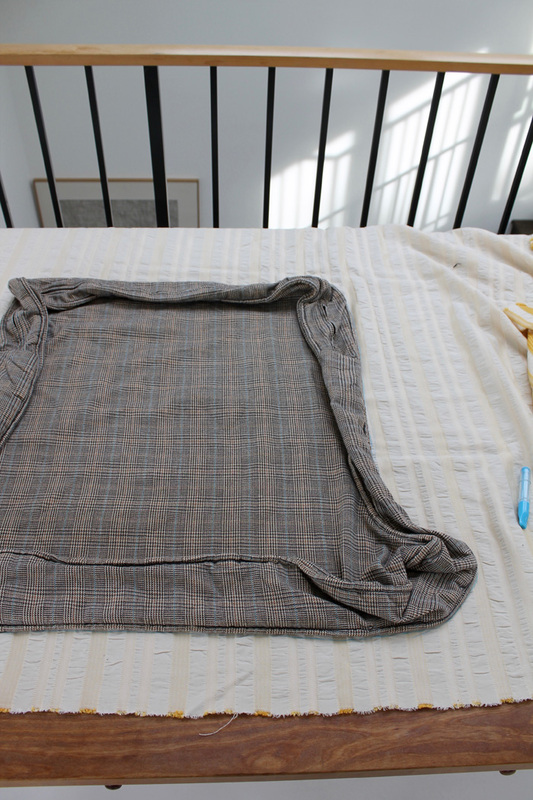 After this carefully remove the insert and sew. By having the zipper extend slightly beyond the panel there is no worry about being able to unzip the thing after everything has been sewn shut -inside out! Btw, this is a great tool for tracing and marking. 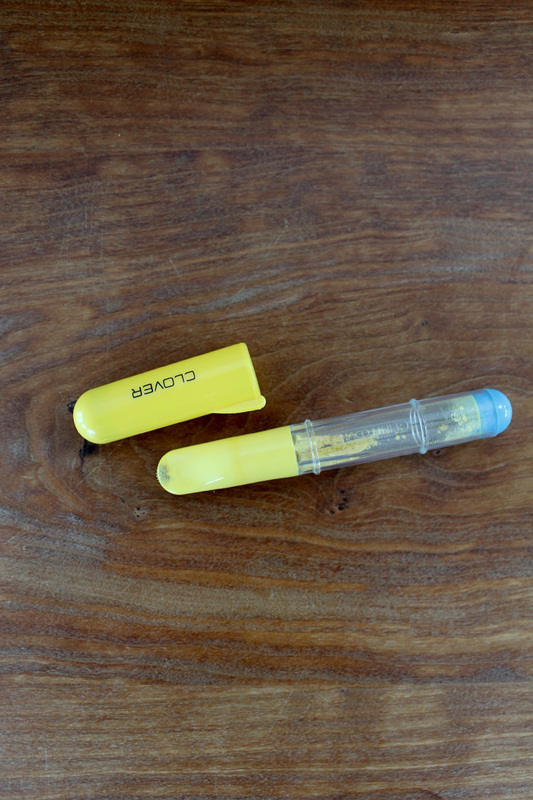 These roller chalk dispensers make a nice thin line and are refillable and of course the chalk washes off. I am pleased with the way this turned out. 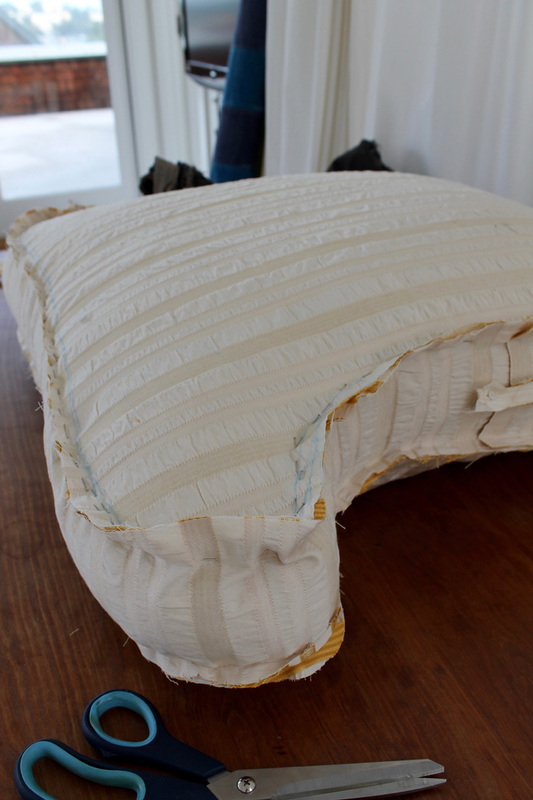 I plan to replace the felt chevron cover on the bolster pillow. Making that was a fun project but the pilling has gotten pretty drastic and it's time for a change.